Upgrade your next lunch with the bold flavors of this spicy summer street corn salad. 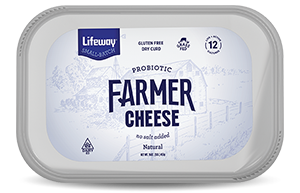 We added our high protein Farmer Cheese for a creamy but healthy take on this fiber-rich seasonal salad. Place corn, green onion, and red bell pepper in a large serving bowl. Toss with olive oil, vinegar, salt and pepper. Top with avocado and Farmer Cheese. Garnish with additional paprika.